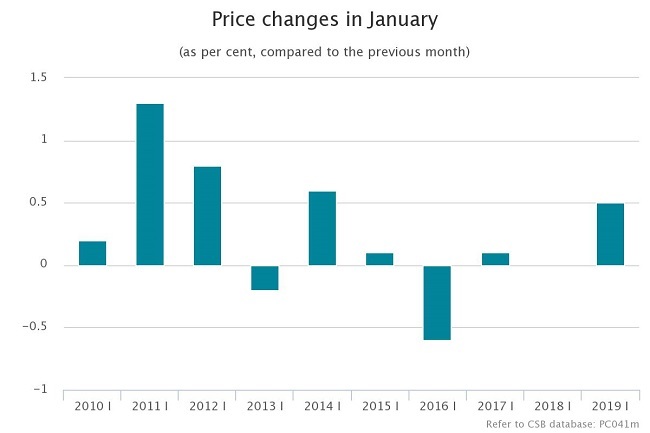 Compared to 2015, in January 2019 consumer prices were 6.9% higher. 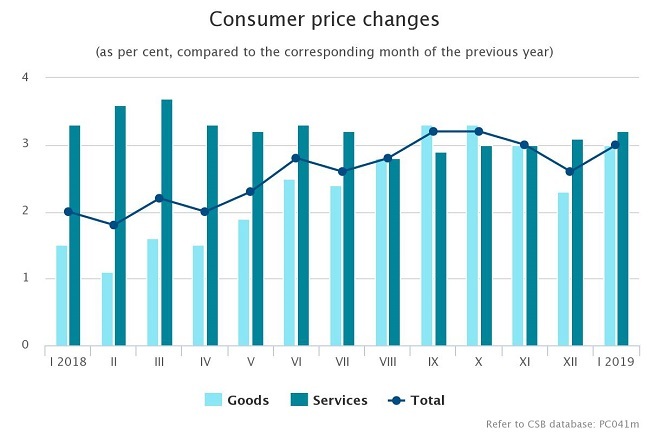 Prices of goods increased by 5.6% and prices of services by 10.2%. 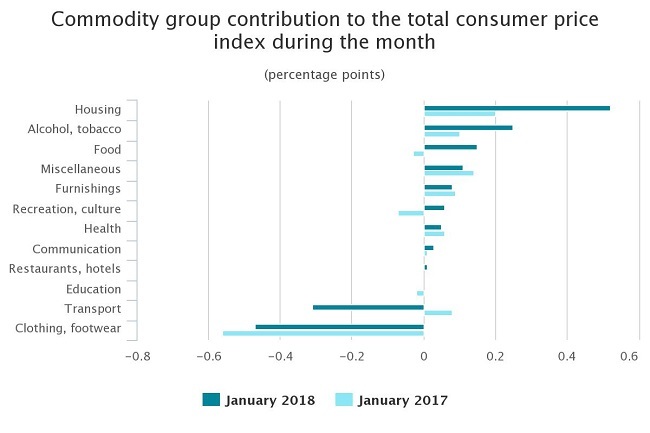 Compared to January 2018, in January 2019 the average level of consumer prices was mainly influenced by the rise in prices of goods and services related to housing, alcoholic beverages and tobacco products, food and non-alcoholic beverages, restaurant and hotel services, prices in recreation and culture group, as well as health care prices. Over the year, prices within the group of food and non-alcoholic beverages increased by 1.4%. Prices of bread (rise of 11.0%) had the greatest upward influence on the average price level within the group. During the year, increase was also registered in prices of fresh vegetables (of 7.6%), fruit and vegetable juices (9.7%), potatoes (14.6%), flours and other cereals (6.0%), dried fruit and nuts (9.0%), beef (10.4%), chocolate (2.8%), and butter (3.5 %). Reduction, in turn, was recorded in prices of fresh fruit (of 2.9%) and, along with the drop on global markets, coffee (3.7 %) and sugar (10.2%) prices. Downturn was also registered in prices of dried, salted or smoked meat (of 1.5%), eggs (4.9%), poultry (2.1%), and milk (3.1%). The average level of prices of alcoholic beverages and tobacco products went up by 7.8%. Prices of alcoholic beverages grew by 6.6%, which was mainly due to the rise in prices of beer and spirits. Prices of tobacco products rose on average by 9.9%. Over the year, prices of goods and services related to housing went up by 7.0%. Increase was also registered in prices of electricity, natural gas, solid fuels, water supply, refuse collection, rentals for housing, heat energy, in maintenance charges in multi-occupied buildings, and in prices of sewage collection. Within the health care group, the average level of prices rose by 2.4%, which was mainly due to the increase in prices of dental services. Growth was registered also in prices in medical specialist practices and prices of pharmaceutical products. During the year, prices within the group of recreation and culture increased by 2.5%. Rise was recorded in television subscription fee, as well as prices of pet food and flowers. The average level of restaurant and hotel service prices went up by 4.2%. The increase was mainly affected by catering services – the average level of restaurant and café service prices grew by 4.6%, of canteen services by 4.4%, and of fast food services by 3.8%. Among other commodity groups, the most significant growth was recorded in prices of diesel, garments, telecommunication services, hairdressing salons and personal grooming establishment services, household cleaning and maintenance products, as well as auto gas. In its turn, the average level of prices of petrol and passenger transport by air reduced. Compared to December 2018, in January 2019 the average consumer price level rose by 0.5%. 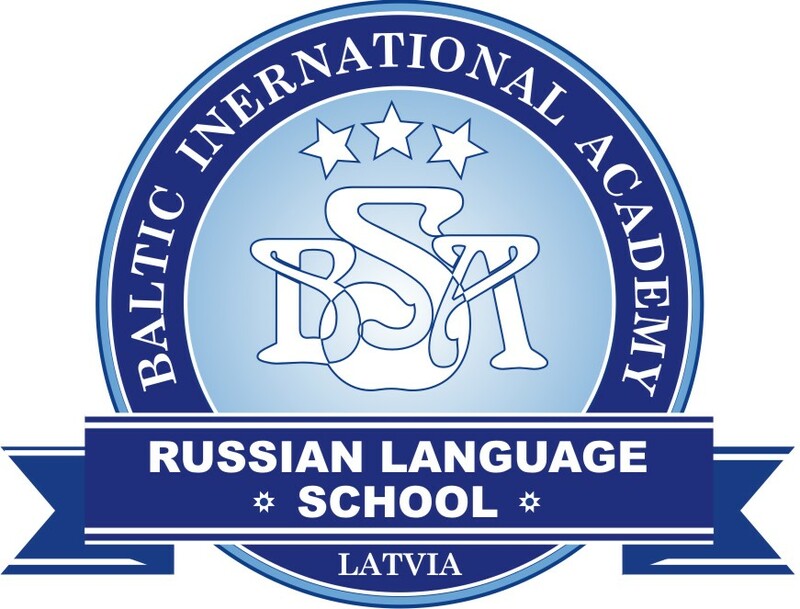 Prices of goods increased by 0.5% and prices of services by 0.3%. 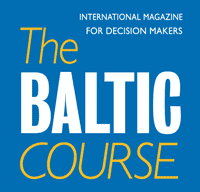 The greatest pressure on the consumer price changes was exerted by the rise in prices of goods and services related to housing, alcoholic beverages and tobacco products, food and non-alcoholic beverages, prices in miscellaneous goods and services group, as well as drop in prices of clothing and footwear, as well as goods and services related to transport. Over the month, the average level of food and non-alcoholic beverage prices went up by 0.7%. The greatest upward pressure on the consumer price changes was exerted by the rise in prices of fresh fruit (of 5.6%), fresh vegetables (2.7%), bread (2.6%), chocolate (4.6%), fresh or chilled fish (6.9%), sugar (3.1%), and butter (2.2%). Decline, in turn, was registered in prices of milk (of 2.7%), yoghurt (1.8%), coffee (1.0%), and eggs (1.2%). The average level of alcoholic beverage and tobacco product prices of went up by 3.0%. Prices of alcoholic beverages increased by 2.2%. Prices of tobacco products rose on average by 4.2%. Under the influence of seasonal discounts and sales, prices of garments diminished by 8.9% and prices of footwear by 6.4%. 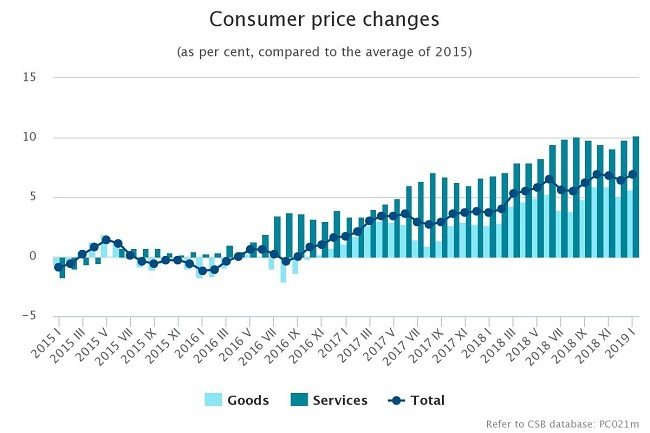 The average level of prices of goods and services related to housing increased by 3.4%. Resulting from the increase of the electricity price component, electricity price grew on average by 10.7%. Moreover, as new natural gas distribution system tariffs (which now will include two components – fixed cost and variable cost) came into force as of 1 January, natural gas price to be paid by household on average increased by 10.4%. Resulting from the rise of natural resources tax, prices of refuse collection services grew by 14.2% and maintenance charges in multi-occupied buildings by 2.1%. Prices of goods and services related to transport decreased by 2.2%, which was mostly influenced by the decline in prices of fuels for transport (of 2.8%), of which drop in diesel price of 3.0% and in petrol price of 2.9%. Reduction was also registered in prices of passenger transport by air, while prices of maintenance and repair of personal transport equipment increased. The rise in the average level of prices within miscellaneous goods and services group was mainly affected by prices of articles for personal hygiene and beauty products (up by 4.4%). 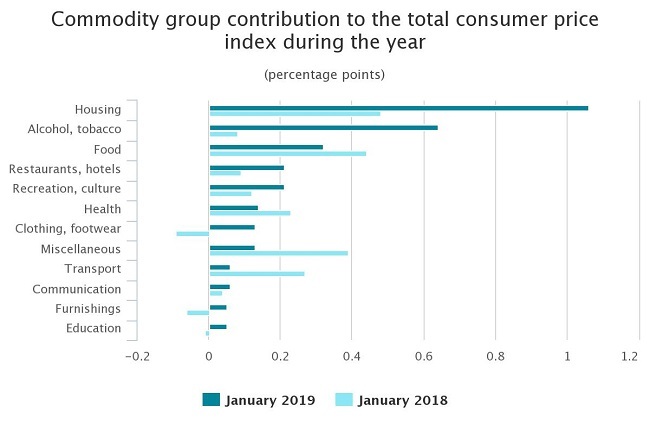 Among other commodity groups, the most significant increase was recorded in prices of household cleaning and maintenance products, dental services, pet food, in television subscription fee, and prices of catering services. In its turn, the average level of package holiday prices dropped.